Malaysian Prime Minister Najib Razak speaks at the opening ceremony of the Association of Southeast Asian Nations (ASEAN) summit in Kuala Lumpur, Malaysia, Saturday, Nov. 21, 2015. Malaysian Prime Minister Najib Razak on Saturday called on his fellow Southeast Asian leaders to unite in “moderation over extremism” to combat jihadists. Opening the 27th ASEAN Summit, the host leader said he was altering the remarks he intended to deliver in order to address the recent terrorist attacks by Muslim extremists in France, Mali and elsewhere. “We must not lose sight of the fact that the ideology itself must be exposed as the lie that it is and vanquished, for it is not Islamic. It cannot be,” said Najib, a Muslim who governs a country with a majority Muslim population. Police officers check security arrangements for the 27th Association of Southeast Asian Nations (ASEAN) summit in Kuala Lumpur, Malaysia, Nov. 20, 2015. The subject also was discussed when Najib met Friday evening with President Barack Obama in Kuala Lumpur. "It's important for us to present the authentic Islam," Najib said to reporters after the meeting. 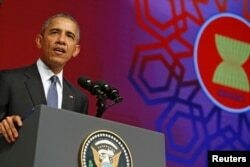 “Malaysia is part of the coalition to fight [the Islamic State group] and can be extraordinarily helpful on issues like countering the destructive and perverse narrative that’s developed,” Obama told reporters. U.S. President Barack Obama delivers remarks at the ASEAN Business and Investment Summit in Kuala Lumpur, Malaysia Nov. 21, 2015. Najib, in his remarks Saturday to fellow leaders at the summit’s opening, contended ASEAN, since its inception in 1967, has helped to keep the peace. 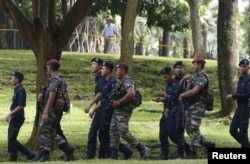 Malaysia and the region, for some years, however, have been seeing increasing support among its Muslim extremists for such groups as al-Qaida and the so-called Islamic State, according to regional security officials. The current ASEAN summit has apparently been targeted for attack by suicide bombers, according to a bulletin circulated by police in Sabah state. More than 4,500 soldiers have been dispatched to Kuala Lumpur during the ASEAN meetings, according to Malaysia’s army. Outside the Kuala Lumpur Convention Center, the main venue for the ASEAN summit, police are posted in tandem with red-beret Malaysian paratroopers armed with M4 carbines. Sabah police have noted that a meeting took place last Sunday in the southern Philippines autonomous province of Sulu among elements of the Islamic State group, the Abu Sayyaf terrorist group and the Moro National Liberation Front. At the meeting were “14 leaders from the three outfits and 50 members of Abu Sayyaf armed with M16 rifles, pistols and bombs,” according to the police document, which also said Islamic State and Abu Sayyaf have eight suicide bombers in Sabah, a western Malaysian state, and 10 in Kuala Lumpur. The Philippines’ Jolo island, in the Sulu archipelago northeast of Malaysia’s Sabah province, is a stronghold of Abu Sayyaf, known for its bombings and kidnappings of foreigners for ransom. Authorities on Jolo say a severed head was left in a bag in front of a police station there on Tuesday after Abu Sayyaf claimed to have beheaded Bernard Then, an electrical engineer, who was abducted in Sandakan, Sabah in May. Najib noted Then’s killing in his remarks Saturday, adding that in a “highly diverse” region it was imperative for ASEAN’s 10 nations to form a shared vision to counter extremists trying to sew disunity. ASEAN, long criticized as ineffectual, bureaucratic and indecisive, is to make a significant and potentially historic step Sunday when it inaugurates the ASEAN Economic Community. The AEC, intended to create a single market and production base, is to begin operations December 31. But observers say many practical mechanisms remain to be implemented by its members in order for it to effectively allow more open trade and exchange of skilled workers across national borders. The Obama administration welcomed the move. "The United States is working with ASEAN Member States to realize the vision of the ASEAN Economic Community (AEC), as part of the larger ASEAN Community," the White House said in a statement issued Saturday.